Last week we talked about how to access the secret expanded Send To menu, and I mentioned that it was possible to also add folders and locations to the Send To menu. You can also delete some of the ones that are there by default if you don’t need them. Some people have asked about how to do this, so that’s what we’ll do today. You get to the Send To menu by right-clicking on a file or folder, then moving your mouse down to where it says “Send to” – then you’ll see the standard “Send To” menu pop out to the side. The most common use (for me anyway) is to make a desktop shortcut. So instead of storing a folder full of pictures on your desktop (which will slow down the computer), you can store that folder in… oh, I don’t know… maybe the PICTURES FOLDER, and then just have a shortcut to it on the desktop. Same one-click access to that folder, but without cluttering up the desktop and slowing down the computer. You can “Send To” a location, or a program. If you choose to send a file to “Documents”, then a copy of that file will be saved in the Documents folder. If you choose to send a file to “mail recipient”, then a new email compose window will open with that file already attached (to do this, you need to be using an email program such as Outlook or Windows Live Mail – it won’t work with web-based email, like if you go to Yahoo.com to get your email). You can customize what shows up on the Send To menu! So you can delete the junk you don’t need, and add locations and programs that you would use. 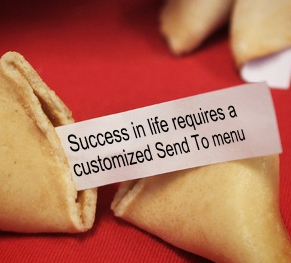 Here’s how you customize the Send To menu. At this point, you can add or remove items from this folder based on what you want in your “Send To” menu. If something is there currently that you would never use (I’m guessing you probably don’t send too many things to a “fax recipient”), just right-click and delete it. To add a new folder or a new location here, you just create a shortcut for that folder or location inside the Send To folder. For example, let’s say you want to add the Pictures folder as a destination in your Send To menu. 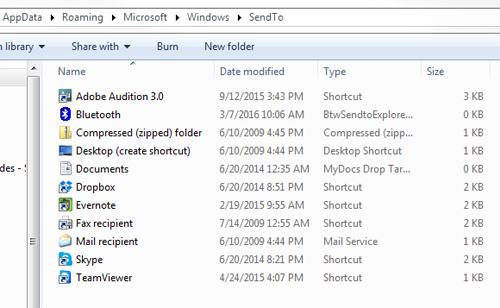 With the Send To folder open, do a right-click in the main open area and choose New – Shortcut. Then click on Browse and choose your Pictures folder. Now, when you right click and choose Send To on a picture, you can opt to send it to the Pictures folder. Easy! It just takes a minute to get the Send To menu just the way you want it, but it can save you a lot of time in the future because it makes the process a lot more efficient.